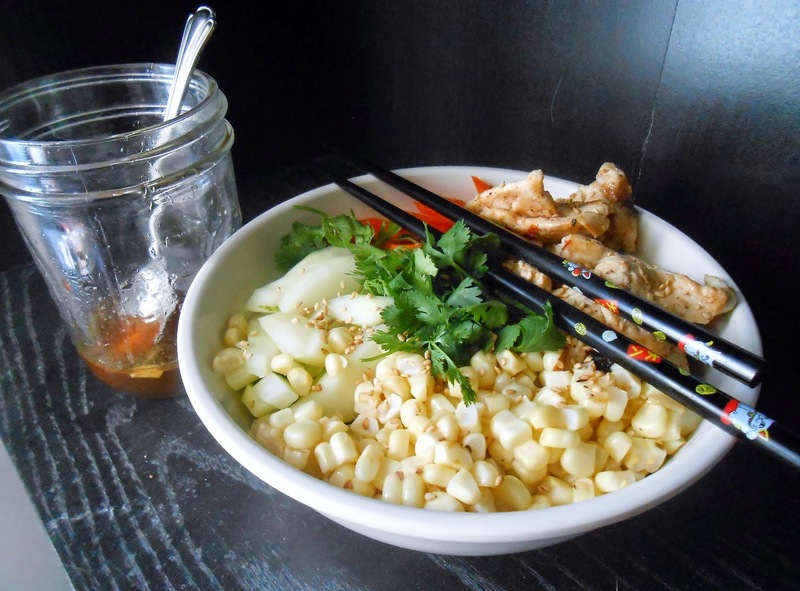 Vietnamese noodle bowls are a summertime staple in our house. This is the main thing I order at Vietnamese restaurants (even when everyone else is ordering pho). There aren't very many rules when you make it at home (this one had corn, because we had fresh white corn) but it always needs to have rice noodles, cucumber, carrots, cilantro, mint, basil and noum cham (citrus fish sauce dressing). Begin by marinating the chicken in some fish sauce, lime juice, sesame oil, garlic and ginger. It doesn't have to be very long (half hour at most). Slice thin and cook quickly in a skillet. Set aside to cool. Next, make the noum cham sauce. Mix equal parts fish sauce, lime juice and sugar together. Dilute the sauce with some warm water and a touch of sesame oil until it's appropriate strength. Thinly slice one clove garlic and one thai chili to mix with the sauce. Julienne all your vegetables and begin by layering your lettuce at the bottom of the bowl. Drizzle fish sauce dressing over the top. Toss all ingredients together and eat immediately.